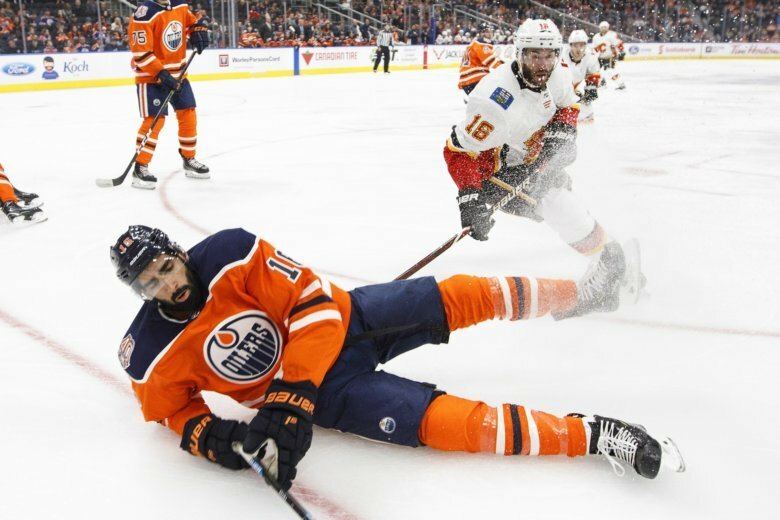 EDMONTON, Alberta (AP) — Kailer Yamamoto celebrated his 20th birthday with two goals in the Edmonton Oilers’ 4-3 preseason victory over the Calgary Flames on Saturday. Connor McDavid and Jujhar Khaira also scored and Cam Talbot made 39 saves to help the Oilers improve to 6-1. Johnny Gaudreau, Sam Bennett and Elias Lindholm scored for Calgary. Edmonton will face the Cologne Sharks in an exhibition game Wednesday night in Germany, and open the regular season next Saturday in Sweden against the New Jersey Devils. At Boston, Brian Elliott made 26 saves, and Michael Raffl scored twice in the third period to lead the Flyers. Taylor Leier and Wayne Simmonds also scored for Philadelphia (4-2-1). Ryan Donato scored for Boston, and Tuukka Rask made 20 saves. The Bruins, who open the regular season Wednesday at the defending Stanley Cup champion Capitals (5-2-1). At Detroit, Jonathan Bernier made 25 saves to lead the Red Wings over the Maple Leafs. Dominic Turgeon, Vili Saarijarvi, Martin Frk, Libor Sulak and Matt Puempel scored for Detroit (7-1-0). Curtis McElhinney allowed all five Detroit goals on 37 shots, and Carl Grundstrom scored for the Maple Leafs (5-2-0). At Sunrise, Florida, Andrei Vasilevskiy made 31 saves to lead the Lightning past the Panthers. Mathieu Joseph, J.T. Miller and Cory Conacher scored for Tampa Bay (4-3-0). Jonathan Huberdeau and Mike Hoffman scored for Florida (3-4-0). Roberto Luongo made 23 saves. At Ottawa, Ontario, Matt Duchene had a goal and an assist, Craig Anderson stopped 19 shots and Ottawa beat Montreal. Tom Pyatt and Bobby Ryan also scored for the Senators (2-4-0). Carey Price gave up all three goals on 21 shots in two periods, and Antti Niemi stopped all 10 shots he faced in the third period for Montreal (4-3-0). In Chicago, Cam Ward made 16 saves to lift the Blackhawks past the Blue Jackets. Brent Seabrook, Artem Anisimov, Brandon Saad and Patrick Kane scored for Chicago (2-4-0). Jonathan Davidsson scored for the Blue Jackets (3-5-0), and Joonas Korpisalo made 23 saves. At Kelowna, British Columbia, Michael Grabner and Derek Stepan had a goal and an assist to lead Arizona. Christian Fischer and Brad Richardson added goals for the Coyotes (4-2-0). Nikolay Goldobin scored a third-period goal for Vancouver (1-6-0). Jacob Markstrom made 12 saves for Vancouver and Darcy Kuemper had 15 stops for Arizona. At Los Angeles, John Gibson made 32 saves to record a shutout for the Ducks. Troy Terry, Carter Rowney and Ben Street scored for Anaheim, which finished preseason play 3-3-0. Jonathan Quick stopped 34 of 37 shots for the Kings, who went 1-4-1 in exhibition play.